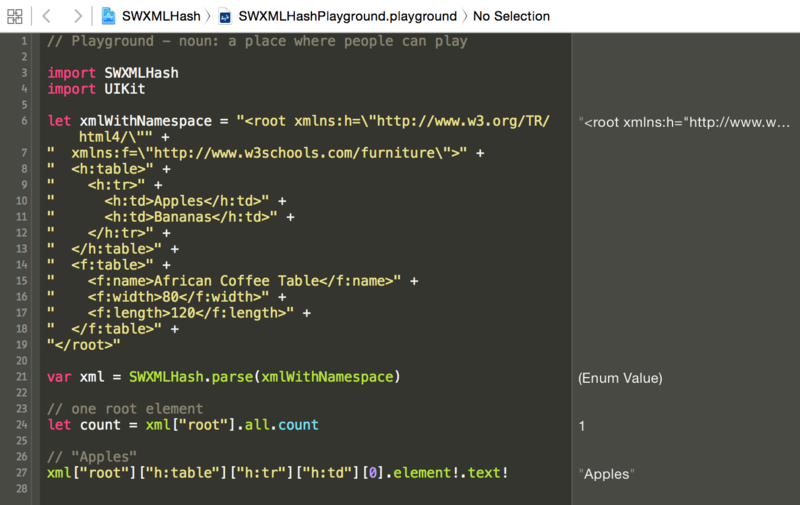 SWXMLHash is a relatively simple way to parse XML in Swift. If you're familiar with NSXMLParser, this library is a simple wrapper around it. Conceptually, it provides a translation from XML to a dictionary of arrays (aka hash). The API takes a lot of inspiration from SwiftyJSON. SWXMLHash can be installed using CocoaPods, Carthage, Swift Package Manager, or manually. swift build should then pull in and compile SWXMLHash for you to begin using. To install manually, you'll need to clone the SWXMLHash repository. You can do this in a separate directory or you can make use of git submodules - in this case, git submodules are recommended so that your repository has details about which commit of SWXMLHash you're using. Once this is done, you can just drop the SWXMLHash.swift file into your project. NOTE: if you're targeting iOS 7, you'll have to install manually because embedded frameworks require a minimum deployment target of iOS 8 or OSX Mavericks. If you're just getting started with SWXMLHash, I'd recommend cloning the repository down and opening the workspace. I've included a Swift playground in the workspace which makes it easy to experiment with the API and the calls. This determines whether not to use lazy loading of the XML. It can significantly increase the performance of parsing if your XML is large. This setting allows for key lookups to be case insensitive. Typically XML is a case sensitive language, but this option lets you bypass this if necessary. This setting allows for explicitly specifying the character encoding when an XML string is passed to parse. This setting mimics Codable's userInfo property to allow the user to add contextual information that will be used for deserialization. This setting attempts to detect XML parsing errors. parse will return an XMLIndexer.parsingError if any parsing issues are found. All examples below can be found in the included specs. Alternatively, if you're parsing a large XML file and need the best performance, you may wish to configure the parsing to be processed lazily. Lazy processing avoids loading the entire XML document into memory, so it could be preferable for performance reasons. See the error handling for one caveat regarding lazy loading. The above approach uses the new config method, but there is also a lazy method directly off of SWXMLHash. The below will return "John". The below will return "123". Alternatively, you can look up an element with specific attributes. The below will return "John". The all method will iterate over all nodes at the indexed level. The code below will return "Fiction, Non-fiction, Technical". The below will print "root", "catalog", "book", "genre", "title", and "date" (note the children method). The following will return return "Midnight Rain". Filtering can be by any part of the XMLElement class or by index as well. // everything is good, code away! Note that error handling as shown above will not work with lazy loaded XML. The lazy parsing doesn't actually occur until the element or all method are called - as a result, there isn't any way to know prior to asking for an element if it exists or not. You can convert any XML to your custom type by implementing XMLIndexerDeserializable for any non-leaf node (e.g. <book> in the example above). For leaf nodes (e.g. <title> in the example above), built-in converters support Int, Double, Float, Bool, and String values (both non- and -optional variants). Custom converters can be added by implementing XMLElementDeserializable. For attributes (e.g. isbn= in the example above), built-in converters support the same types as above, and additional converters can be added by implementing XMLAttributeDeserializable. Types conversion supports error handling, optionals and arrays. For more examples, look into SWXMLHashTests.swift or play with types conversion directly in the Swift playground. Does SWXMLHash handle URLs for me? No - SWXMLHash only handles parsing of XML. If you have a URL that has XML content on it, I'd recommend using a library like AlamoFire to download the content into a string and then parsing it. Does SWXMLHash support writing XML content? No, not at the moment - SWXMLHash only supports parsing XML (via indexing, deserialization, etc.). I'm getting an "Ambiguous reference to member 'subscript'" when I call .value(). .value() is used for deserialization - you have to have something that implements XMLIndexerDeserializable (or XMLElementDeserializable if it is a single element versus a group of elements) and that can handle deserialization to the left-hand side of expression. You'll get an error because there isn't any built-in deserializer for Date. See the above documentation on adding your own deserialization support. In this case, you would create your own XMLElementDeserializable implementation for Date. See above for an example of how to add your own Date deserialization support. Chances are very good that your XML content has what is called a "byte order mark" or BOM. SWXMLHash uses NSXMLParser for its parsing logic and there are issues with it and handling BOM characters. See issue #65 for more details. Others who have run into this problem have just stripped the BOM out of their content prior to parsing. How do I handle deserialization with a class versus a struct (such as with NSDate)? Using extensions on classes instead of structs can result in some odd catches that might give you a little trouble. For example, see this question on StackOverflow where someone was trying to write their own XMLElementDeserializable for NSDate which is a class and not a struct. The XMLElementDeserializable protocol expects a method that returns Self - this is the part that gets a little odd. See below for the code snippet to get this to work and note in particular the private static func value<T>() -> T line - that is the key. Feel free to shoot me an email, post a question on StackOverflow, or open an issue if you think you've found a bug. I'm happy to try to help! See CHANGELOG for a list of all changes and their corresponding versions. See CONTRIBUTING for guidelines to contribute back to SWXMLHash. SWXMLHash is released under the MIT license. See LICENSE for details.